Wing span: 1 3/4 - 2 1/8 inches (4.5 - 5.3 cm). Identification: Wings are translucent, whitish, with no yellowish tint underneath. 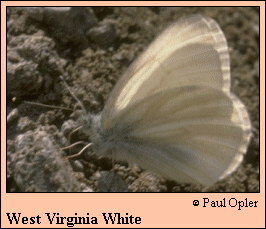 Underside of hindwings with blurry brown or pale gray scaling along veins. Life history: Males patrol slowly to locate females. Eggs are laid singly on undersides of host plant leaves. Chrysalids hibernate on stems or plant litter under the plant. Flight: In the North, one flight in May; in the South, one flight from April-May. Caterpillar hosts: Toothworts (Dentaria diphylla and D. laciniata) in the mustard (Brassicaceae) family. Adult food: Flower nectar from toothworts, spring beauty, violets, and other plants. Habitat: Moist deciduous woodlands or mixed woods. Range: Northern Great Lakes states and from New England southwest along the Appalachians to north Georgia and northeast Alabama. Conservation: A species of native, relatively undisturbed habitats. Declining due to timbering, development, and spread of garlic mustard (Alliaria officinalis). Management needs: Control spread of garlic mustard. Ensure timbering intensity allows recovery of sufficient habitats on local scale. Collaborative Ltd., Guelph, Ontario, Canada.